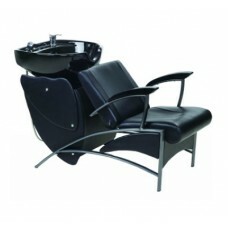 Our newest backwash system, The Lazy Cadi, is shown above in black or white bowl. Fully cushio.. This comfortable Shampoo Chair comes equipped with everything you need to quickly and easily set up .. This comfortable Shampoo Chair comes equipped with an adjustable foot-rest and has everything you n..
Deluxe backwash shampoo unit features a black chair back and seat upholstered with high quality co..